With the powerful capabilities of 8x8 Speech Analytics, users can analyze the full spectrum of their customer interactions and listen to the most important ones, rather than a random handful that have no predetermined context. Audio data can be searched and analyzed for compliance, customer insights, and agent performance to improve your customer experience. Recorded customer interactions contain a vast amount of untapped data that gets to the heart of your customers’ concerns. 8x8 Speech Analytics, with automated speech-to-text transcription, extracts valuable insights from these unstructured voice conversations. 8x8 Speech Analytics delivers the following features, enabling you to dynamically process call center data and deliver high-quality service to your customers. The emotion detection capability combines traditional text-based sentiment analysis with acoustic-based analysis of speaker tone to provide a deeper understanding of speaker emotion. Users can filter calls based on the call’s overall emotion, as well as the emotion of the caller and agent specifically. Overtalk is the average amount of time that the customer and the agent are talking at the same time. The percentage is displayed in the call information section for each call, and can be an indicator of customer dissatisfaction. Speech Center represents the foundation of Speech Analytics and Speech Reporting. The Speech Center page is used to configure and administer Speech Categories, Topics, and Phrases. This implementation brings flexibility and ease of use, and empowers customers to perform speech setup. It also offers some drill-down capabilities for quick access to records that include certain Topics. The Topic-matching functionality relies on phrases belonging to predefined Topics, or Topics that system administrators create themselves. Based on the Phrases defined in the Topic definition, calls that include these Phrases are automatically classified. Via the Speech Center page, users have a simple and effective way of creating speech elements that fit their business needs, and can take advantage of a modern, efficient, and intuitive user experience. This page is divided into three modules that serve three distinct use cases: speech setup, speech tracking, and speech discovery. The Speech Center page can be found in the application navigation bar. The Speech Setup section is displayed on the left, and shows the channel for each Category using the corresponding icon. Users see a full list of all the speech Categories created and the channels they apply to, and can edit or delete an existing speech Category from the list. Deleting a Category affects all the related content under the respective Category. Users have the ability to create a new Category or a new Topic. When customers click “New”, a menu displays, allowing customers to select what they want to create. To create a new Topic, the user must select "Topic" in the “New” drop-down menu. After introducing the Topic name, the user can assign it to an existing Category and one of the possible channels: Caller or Agent. After defining the new Topic, users can start adding Phrases related to the Topic. The user clicks the “+” icon and, just as with Topics, they must add the desired Phrase, choose a Category, and add the Phrase they have defined. "warehouse": Type a single word to find an exact match for the word you typed. “In the warehouse”: Type more than one word to find an exact match for the phrase you typed. "ware*": Type an asterisk directly at the end of a word, or at the end of part of a word, to find a word that begins with the incomplete word you typed. "* mention": Type an asterisk one space before a word to find the word you enter, and any word that exists before it. "promotion *": Type an asterisk one space after a word to find the word you enter, and any word before or after, such as "started" or "ended". Note: A phrase with more words in it produces greater contextual accuracy and fewer false positives. Whenever you make a change, a “reclassify” message appears at the top of the Speech Center page. 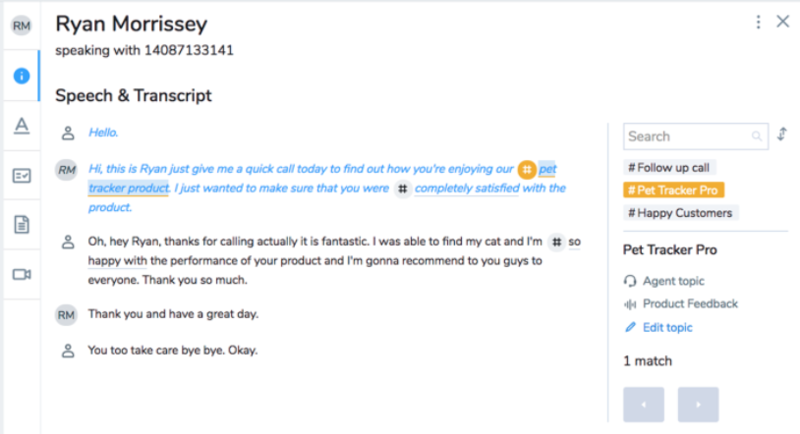 The “reclassify” option gives users the ability to reclassify calls after they've made changes to any speech element. A progress bar is displayed, showing the status of the reclassification process. If the user’s changes to the current setup require reclassification to take effect, the user sees a message to “Reclassify to update your setup with the new changes”. The message cannot be dismissed unless the user chooses to reclassify. If the user chooses not to reclassify, only new call transcripts will match the modified Topics and Categories. When the user chooses to reclassify, they are prompted to choose from a date range. Note: The larger the date range, the longer it takes to reclassify the results. We suggest that you make a large number of changes before you reclassify, as overusing this feature causes system performance to degrade. The visualization on the top-right of the Speech Center page represents the result of Topic-matching in the application. When a user updates the Speech Elements (Categories, Topics, and Phrases), the visualization is not instantly updated, because the reclassification process must first be completed. Click and drag to move the visualization around. Scroll the mouse wheel to zoom in and zoom out. Click the “-” button to reset to the default view. Double-click a Category to change the layout of Topics within that Category. Right-click a Category or Topic to drill down to the call records. The system automatically discovers the most frequently-spoken words, and organizes their relationships to one another. Users have the option to add these words into new or existing Categories or Topics. The highlighted keywords in Categories and Topics are continually updated as new calls arrive and are transcribed. Drag and drop the keyword to the Category or Topic of choice. The Speech Discovery service displays new keyword suggestions over time as new calls are placed. The system also makes relationship suggestions between the suggested Categories and Topics. Users are able to click a suggested Topic and add it as a new Category, or vice versa. When keywords are selected, all the related keywords become highlighted. Users can right-click to perform an action on their selection. Users have three available options in the context menu: Add Category, Add Topic to, and Remove. To add the keywords to the desired Categories or Topics, users must select the corresponding option from the menu. Removing a highlighted keyword does not affect other highlighted keywords that relate to the selected one. Transcript sections in the slide-out panel for calls are now enhanced with searching capabilities for an optimal Speech Analytics experience. The Speech & Transcript section of the slide-out panel is now divided. Call transcripts are displayed on the left, and the search toolbar is displayed on the right. Topic-matched icons appear at the beginning of the sentence when a Topic is discovered. Click the Topic (either in the menu on the right, or inside the transcription itself) to pin the Topic to the screen with more information. When using the "previous/next" function, or when focusing on a phrase/search match, the color of the highlight changes to reflect that the item is selected. Phrases that are exact matches to your search are always underlined. This allows you to see which search results are exact matches. These phrases turn yellow when the corresponding Topic is pinned. The transcript results automatically scroll with the playback of the media. You can disable this, as when evaluating a call that includes screen recording, if auto-scroll is selected, the screen jumps to the transcript and scrolls through the text instead of displaying the video. If you want to disable this feature, next the the small search window in the Speech & Transcript section, you can click a small up-and-down arrow to disable scrolling. When you click a matched phrase, you get the option to give feedback on its accuracy. Please provide as much feedback as possible to help us improve the system! When you send feedback, we display a brief confirmation message that goes away in a few seconds. If the user clicks the phrase again, their previous feedback is shown. They can re-submit their feedback by clicking one of the other feedback icons. An option on the user profile panel allows the user to enable or disable automatic scrolling in the transcript during playback.